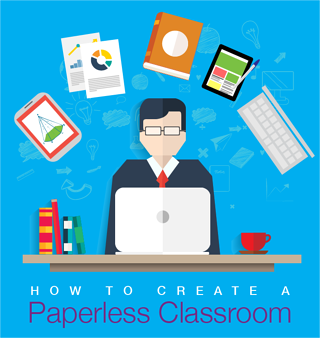 My journey to a redefined paperless classroom began when I started to introduce various types of educational technologies into my classroom. My focus was to introduce new classroom technology as it became available, in order to create a classroom modeled around full “SAMR” implementation. 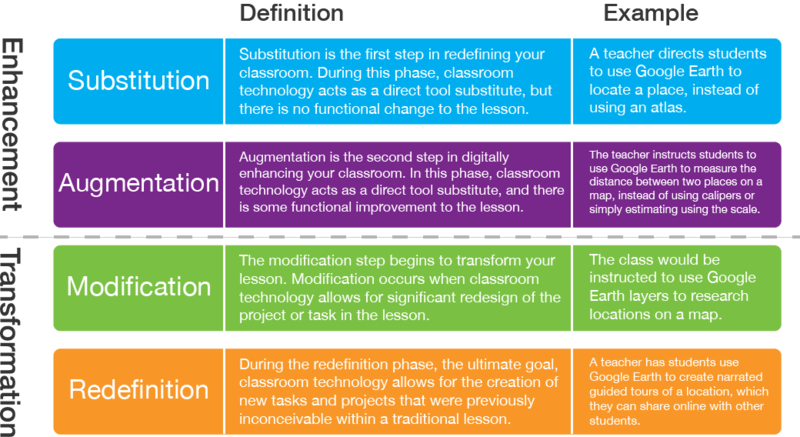 The SAMR (Substitution Augmentation Modification Redefinition) model for classroom technology was developed by Dr. Ruben Puentedura to help educators infuse technology into their daily teaching and learning. By following the SAMR model, teachers are able to design, develop, and integrate digital learning experiences that utilize technology across the curriculum. Substitution: Substitution is the first step in redefining your classroom. During this phase, classroom technology acts as a direct tool substitute, but there is no functional change to the lesson. For example, a teacher might direct students to use Google Earth to locate a place, instead of using an atlas. Augmentation: Augmentation is the second step in digitally enhancing your classroom. In this phase, classroom technology acts as a direct tool substitute, and there is some functional improvement to the lesson. The teacher might now instruct students to use Google Earth to measure the distance between two places on a map, instead of using calipers or simply estimating using the scale. Modification: The modification step begins to transform your lesson. Modification occurs when classroom technology allows for significant redesign of the project or task in the lesson. During the modification phase, the class would be instructed to use Google Earth layers to research locations on a map. Redefinition: Redefinition was my personal goal, because it represents the highest level within the SAMR model. During the redefinition phase, classroom technology allows for the creation of new tasks and projects that were previously inconceivable within a traditional lesson. In a redefined classroom, a teacher might have students use Google Earth to create narrated guided tours of a location, which they can share online with other students. With the SAMR model in mind, I have challenged myself, and many of my colleagues, to “redefine” how they are using technology in their classrooms. I must add that I am fortunate to have a variety of classroom technologies available to me to create my redefined classroom. Many of these technologies I have purchased on my own, while others have been purchased by the school system. By combining and coordinating these tools, I have been able to create a completely paperless, redefined classroom. The school system chose Mimio as the main source of their ed-tech. I have at my disposal a variety of flexible Mimio teaching technologies that can be easily integrated into my daily classroom activities. These technologies allow me to transform my classroom by modifying traditional activities into engaging hands-on experiences for my students. There’s an interactive whiteboard and software that allows me to create my own digital content and activities. I can even download premade lessons from Mimio’s online teaching community. Students become actively engaged by manipulating the content on the interactive whiteboard. With the addition of a mobile app, I can push digital content out to any mobile device in the classroom. The mobile app makes it possible for up to 50 students to control and engage in the digital content. My classroom is further transformed and redefined when I am able to use the mobile app’s collaboration mode, which lets individual students and groups of students collaborate on an activity. The technologies also offer several ways to check my students’ performance for both formative and summative assessment. The classroom devices give me endless possibilities for redefining my Social Studies content and engaging my students. For example, I am able to begin each lesson with some sort of assessment piece in order to gather the data I need to assess student growth within the curriculum. If I were to conduct a geography lesson, I might ask the students about several locations on a map. After the formative assessment, student groups would be given a collaborative activity for which they must use the mobile app to complete and then share with the rest of the class. The lesson could conclude with students sharing their maps for peer review, and with several additional summative assessment questions. Classroom technologies make it easy to transform and redefine your activities. Over the past year, my district was fortunate enough to be able to provide all of my students with a MacBook Air, allowing them to set course on a whole new way of learning. This type of “one-to-one” technology implementation is a key component of full SAMR implementation. With the MacBook, students have the ability not only to explore rich content resources in a variety of formats, but also to create their own content. This capability redefines the learning that takes place in my classroom as students learn about history in an entirely new way, and even produce and share their own historical resources, such as binders, presentations, videos, and more. Similar results could also be achieved with various mobile tablets, Chromebooks, and other laptop solutions. Having a classroom website is an essential tool in redefining how your students learn. A classroom website can host important housekeeping information for students and parents, such as upcoming dates and topics. More importantly, a classroom website can serve as a base from which you can provide students with assignments, content, and assessments. My classroom website, www.mrgigliotti.com, allows me to post information about my class for my students, but it also guides their learning by giving the students access to all of their assignments, content, and assessments. Everything the students and parents need to be successful in my class can be found on my classroom website, and it can be accessed 24 hours a day with a simple Internet connection. Classroom websites are easy to create using software or online website templates. Services like Edmodo can also be used to achieve this effect in your classroom. Each day my students visit my website to check for important news and updates. They can also see a list of all assignments that are due. They then find the current date and use the links to access each assignment, which is housed on its own Web page. The page includes directions for setting up their own digital binder, which they use to create their own content based on the specifications of the lesson. Each of the lessons found on my website contains a high-level learning target, and each lesson page also contains three versions of the lesson. Posting a red, white, and blue version of every lesson gives me the opportunity to provide my students with seamless, differentiated activities. I simply assign each student group a color for that day, and the students follow the directions for that color to complete the activity. I provide links that take students to embedded content, and I allow them to work at their own pace and choose the best resources for their learning style. Students then use what they have learned to create and share their own digital content. Blendspace is a fabulous free resource that allows teachers to search for, organize, and share digital content with their students. Blendspace provides an easy-to-use drag and drop template in which teachers can place digital content such as images, Web pages, and video files. In my classroom, I have traded in our dingy old textbooks for the rich content offered by Blendspace. Rather than reading two lines about a given topic and looking at a grainy image in a textbook, my students can now immerse themselves in multiple images, Web pages, and video files. This allows me to offer my students many options for learning about a topic, and gives students choices, as well. Some students prefer to learn from the Web pages provided, while others prefer the multimedia options. Such a wealth of resources is perfect for a differentiated classroom, as well as for use with students with disabilities. The digital resources I can now provide bring the topics to life for my students and make learning more interesting. LiveBinders is another free classroom resource that allows teachers to completely redefine their classrooms. LiveBinders gives students the ability to create their own digital binders for any type of subject matter. Students can include text, images, and even multimedia in their digital binders. They can create within the binder, or upload files they create. These binders can then be shared with classmates and others around the world. In my classroom, students use LiveBinders to create their own historical resources based on my website-based assignments and Blendspace content. Students begin with blank digital pages and fill them with their own historical information throughout the unit. Their binders are then shared with other students and classes for peer review and editing. LiveBinders also gives students the opportunity to self-assess their progress during each unit. In my classroom, I can log in to students’ binders at any point to check on their progress. I also share login information with their parents, so they can check on their child’s progress with assignments, encourage their completion, and become more engaged in their child’s learning process. Take some time to inventory what types of classroom technologies are available to you and your students. Choose a topic within your curriculum. Plan a traditional lesson that’s based on the topic’s learning targets and standards. Choose an instructional technology that is available to you and your students. Brainstorm ways in which this technology can help enhance and transform how your students will learn about the topic beyond traditional means. Take the time to become familiar with the technology and to test the activity you will be asking your students to perform. When necessary, teach your students how to use the technology in their learning. I always tell my students that “we do not stress over our technology,” because sometimes technology can be frustrating. The long-term rewards far outweigh the short-term frustration. Student-directed learning is also a great strategy when integrating new educational technology in your classroom. Students can often teach one another a great deal about technology – and, by accident, about your content. Do not be afraid of your technology, and do not give up when the technology does not cooperate. Help is always available from Mimio’s online teaching community!